I saw Blackberry Winter Thursday night at Actor's Express. I'd never seen lead actress Carolyn Cook—multi Suzi Bass Award winner—but immediately became a devout fan. The story—by Steve Yockey—is profound and highly emotional, and is delivered poignantly and perfectly by Cook. I was surprised to learn that "blackberry winter" is a primarily Southern colloquialism. Viewers will know after just the first few words escaping Vivienne Avery's (Carolyn Cook) mouth, that sh'es without a doubt Southern! Blackberry winter describe a brief period of cold weather that coincides with the time when blackberries are in bloom, typically in early to mid May. Blackberries happen to be may favorite food, so those cold snaps are a little scary, but they couldn't possibly approach the fear of watching helplessly with a slowly degrading loved one. 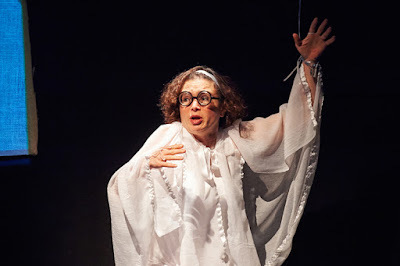 Blackberry Winter is a "story of a woman caring for her Alzheimer’s diagnosed mother," starring Carolyn Cook and is a co-production with Out of Hand Theater whose Co-Artistic Director Ariel Fristoe is directing the production. The play, commissioned and developed by Out of Hand Theater, is also a National New Play Network (NNPN) Rolling World Premiere and will be produced at seven theaters around the country during the 2015-2016 season. 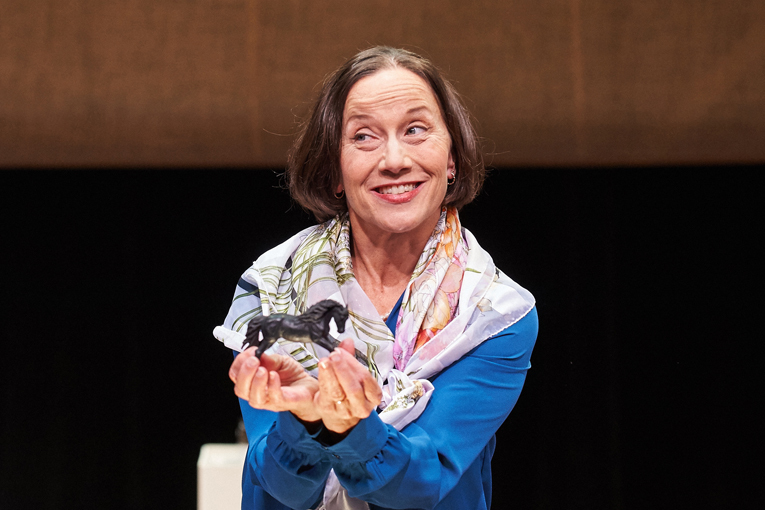 As serious and heartbreaking as the subject matter is in this play, Vivienne Avery's "granite smile" and stoic resolve are not deplete of humor...especially when it comes to the all-too-familiar "swear jar", which contains a small fortune by the play's end. Joe Sykes performs the role of Gray Mole, a character in the mythical 'origin story' of Alzheimer's, which was created by Vivienne and shared with the audience via animation. Maia Knispel portrays the role of White Egret in the mythical 'origin story' of Alzheimer's created by Vivienne. She's elegant and key to the overall story--she's the character who desperately tries to do something about her friend's memories, fearing that they'll be lost forever. The animated 'origin story'--projected on multiple screens throughout the performance space—tells Vivienne's creative "how-this-came-to-be" story of Alzheimer's, which is narrated by Gray Mole and White Egret. The segments of animated origin story and Carolyn Cook's dialogue I do not believe could not be of greater contrast, yet are perfectly complementary. High praise goes to the creative team of Blackberry Winter, specifically for the set design and its subtle, yet high-impact light features. On each of twelve pedestals on the stage rest a prop(s) used to tell the Vivienne's story, each illuminated during that prop's time in the spotlight. This is very subtle and I didn't catch it until nearly the end of the show, but that speaks to how well it was incorporated into the overall theater-goer experience. I've mentioned that this is an emotional play. I think it hits home with more people than most might think. I found myself saddened thinking of my own mother and her struggle with memory loss. I do not believe she's affected by Alzheimer's, but she has had memory issues for many, many years. This year, under the treatment of a new doctor and new memory medicines, the mother I once new and adored resurfaced...it was miraculous! She doesn't live here in Atlanta, but we had some wonderful, lengthy conversations during that period of resurgence. It was also an emotional experience for the friend who went with me the other night. I notice the wiping of tears while we were watching. 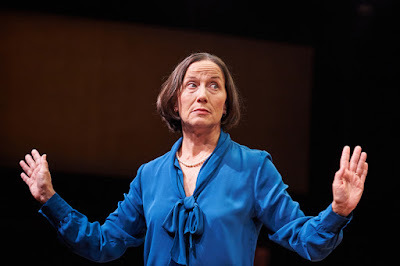 It turns out that his mother passed away of Alzheimer's, which I didn't know prior to the play. As emotional as an experience as it was, he told me that he's grateful that the play is creating awareness of just how difficult the disease is, for those who suffer and those who care for them. 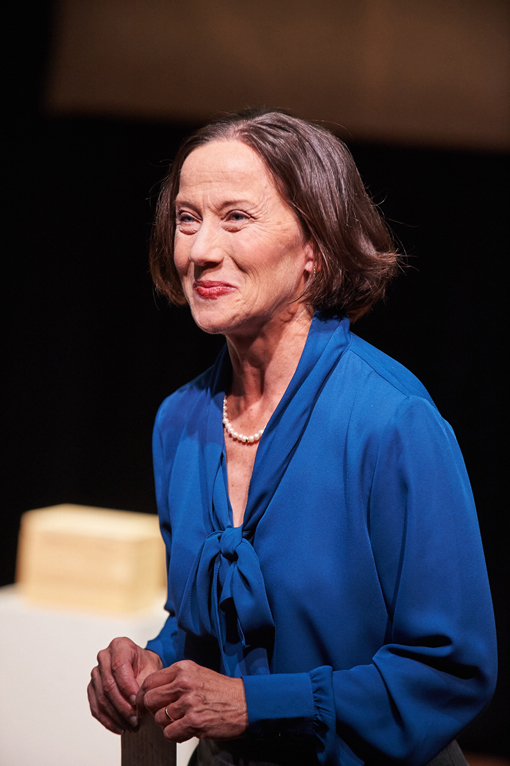 Please read about Carolyn Cook's personal journey and why she was perfectly cast for the role of Vivienne Avery in Blackberry Winter in this Atlanta Journal-Constitution article. DO NOT miss this play! I will be shocked if Blackberry Winter and Carolyn Cook do not win multiple awards. The story is moving and the performance is superb! One thing to note, Vivienne's dialog is directed at the audience, but it's not an interactive performance. What it is, is perfectly brilliant! 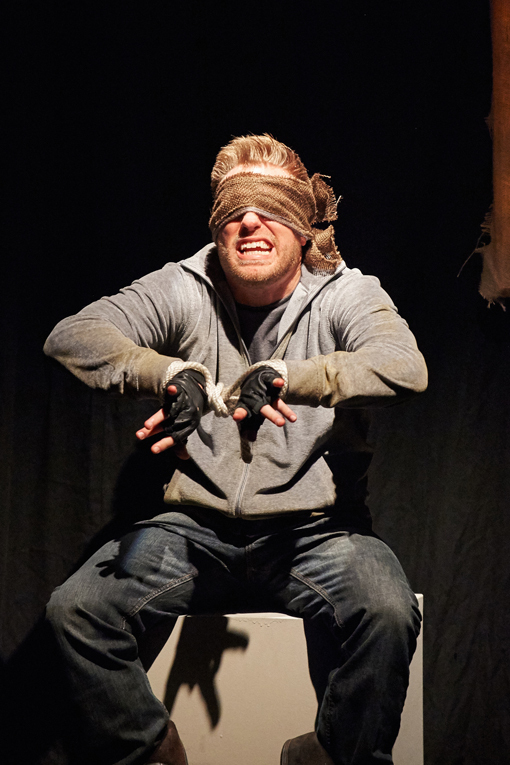 Both world premieres, Blackberry Winter and The Thrush & the Woodpecker, both by Steve Yockey, were onstage in rotating repertory. Blackberry Winter continues to be onstage at Actor's Express now through Sunday, November 22.